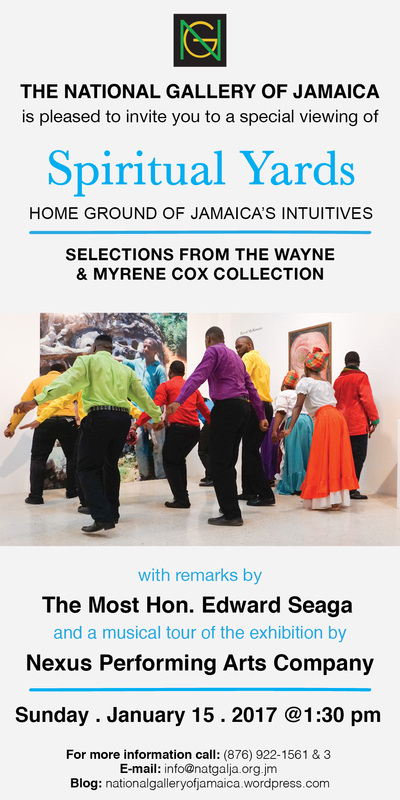 Spiritual Yards: Home Ground of Jamaica’s Intuitives – Selections from the Wayne and Myrene Cox Collection will be on view at the NGJ from December 11, 2016 to January 29, 2017. Here is the first of a series of short features on the artists in the exhibition, organized according to which gallery their work appears in, and accompanied by rare video footage on each of them, courtesy of Wayne Cox (all rights reserved). Pastor Winston Brown (1932-2015) was born in Manchester and moved to Hope Bay, Portland, as a young adult. He was employed in Public Works for the Parish Council and later kept a shop. In his spare time, he would visit various churches, sermonizing based on his visions. He built a house just west of Hope Bay, adding on a room at a time. Pastor Brown began with creating assemblages mounted on poles. He painted vibrant floral and abstract design on his walls and on objects outside. On the street, he constructed signs and assemblages with spiritual messages, calling this place the Garden of Eden attraction. He leaned zinc fencing painted with his designs along the slope of the hill across the street. He had a bench there where he would lie down, read his Bible and wave to drivers passing through the Garden of Eden. Reginald English – Jonkunnu Fisherman (1995), Wayne and Myrene Cox Collection. Reginald English – Dances with Whoodie (1993), Wayne and Myrene Cox Collection. Reginald English (1929-1997) was a Jonkunnu performer, who was known for creating painted metal cut-outs depicting Jonkunnu characters and spirit figures he called “whoodies” which he believed lived in the countryside. During the 1980s and 1990s, English created and sold these works of cut-out metal at a stand on the main road just east of Boscobel, St Mary. English often recycled discarded metal to make his figures, which displayed strong gestural characteristics, and he used metallic automotive spray paint to provide vivid and radiant colouring. His work was has been exhibited both locally and overseas, most notably in the exhibitions Prophets and Messengers (2000) and Intuitives III (2006) at the Mutual Gallery in Kingston and National Gallery of Jamaica, as well as the Redemption Songs exhibition in the United States, held in 1997. English also represented in the permanent collection of the Patricia and Phillip Frost Art Museum in Miami.